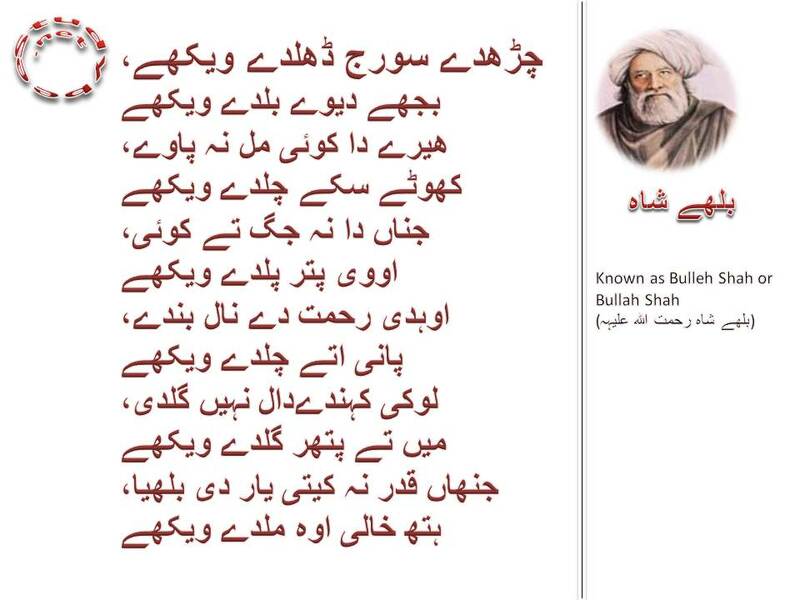 ‘Charde suraj dhaldy wekhy, bujhe deway balday wekhay’ by Bulleh Shah is yet another awakening poem, ‘kafi’, by Baba Bulleh Shah. The theme is: value your loved ones. He tells in quite simple way that time and tide keep rolling and wealth & riches keep shifting from one family to another. He shares his experience that oftentimes has he seen the downfall of the once rich and affluent people whilst several others, doomed by the day, were able to stand up and reach the skies. There have been times when diamond was not valued better than a brass farthing. Even orphans, supposed to die of hunger and necessities, have gone on to become the greatest of kings and they ruled the world. And when God has blessed and graced his near and dear ones; they may even walk on water. But Bullah concludes his poem in a deeply emotional yet convincing tone: “The one who values not his friend(love) is often seen as empty handed, later ruing but of no effect”.